Of Lady Demeter, goddess of the golden grain, I sing, and her fair-ankled daughter Persephone whom the ancients addressed as Kore, The Maiden, in whose laughter is the promise of spring. Now Kore was playing away from the protection of her mother, who is also the lady of the golden sword. In a meadow she found two flowers she had never seen before, narcissus and hyacinth, and gathered them in her apron to make a garland. Alas, had she known their history, she might not have been so grasping! Did not Narcissus waste away upon the riverbank pining after his reflection far below? Did not Hyacinth’s blood stain the grass after he was struck by a faithless discus cast from his lover Apollo? The lure taken, the trap was sprung. A chasm opened. Hades on a chariot drawn by dreadful horses erupted from the earth and bore her down. The jaws of the ground closed over Persephone’s cry of Father. Futile, for Zeus her sire had secretly promised her as bride to lord Hades. 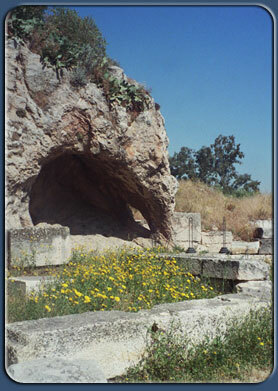 No one knew what had happened save Hekate in the ear of her cave and Helios the all-seeing Sun. Demeter searched for nine days, abstaining from food and drink. At last wise Hekate found her and reported what she had heard, and they sought out Helios to learn what he had seen. He told them of the chariot and the maiden, and, more, he told them of Zeus’ secret meeting with the underworld god. Enraged, Demeter withdrew from Olympus and the counsels of heaven and wandered mortal lands in the guise of an old woman in mourning. 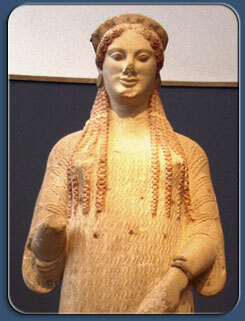 At length she came to Eleusis, where she was welcomed as a guest by king Keleos and his wife Metaneira. She soon won their trust and the charge of their infant son. Demeter found solace in nursing the child, feeding him with divine ambrosia and cradling him each night in the hearth. Then might his fate have been blessed, but Queen Metaneira stumbled upon this scene one night and snatched her boy from the live coals with brave fright. Demeter cast away her mask of old age and loomed over the queen, filling the hall with radiant light and lovely fragrance. “What fools are mortals! I would have made him a god, but you have undone all!” She demanded a temple be built and sacred rites established in her name. In anger, they thought, but in later years the Eleusinian Mysteries promised its initiates a blessed afterlife and provided hope to millions. Yet Demeter kept pining for her lost daughter, and the earth gave vent to her grief. The young grain buried in earth did not rise again, barley lay where it was scattered, and the world went hungry. Lest the gods’ worshipers be destroyed, Zeus sent messengers to Demeter begging for her to relent. Iris the rainbow came down to her, and many another god and goddess with rich gifts. Yes, Zeus begged, most often known for his conquest of other goddesses. At last, seeing she would not be moved, Zeus sent Hermes down to Hades to ask for the maiden’s return. Hades feigned to give consent, saying he would be a poor husband if he denied the commands of his brother and of his wife’s mother. Yet the lord of the dead contrived to win Persephone’s heart with honeyed words, promising her great dominion as his queen, and giving her one blood-red pomegranate seed to eat before returning her to the living world above. Mother and child rejoiced to be reunited, and Hekate with her torch stood by to light and honor the goddesses. Afterwards she became Persephone’s attendant. But their joy was marred by sorrow. On learning that her daughter had taken food in Hades’ dread domain, Demeter was much distressed, for now the realm below had claim to her. Yet they obeyed the decree of Zeus, ruler of the gods. For two thirds of the year Persephone would dwell in the world above with her mother. Then spring would usher in new green and the world would blossom and grow fruitful. For one third she would reside with her husband beneath the earth. Soil would go cold, plants would die, and the earth would mourn along with lady Demeter. another lot as he wastes away in dank darkness. Thus the promise of hope born from Persephone’s suffering and return to the upper world.